Carrots and squash pan-fried in a simple honey and olive oil glaze with a carrot top chimichurri sauce. You throw your carrot tops away? How dare you! Well, never again will I waste a carrot top. And never again will I buy tasteless, bulk carrots after buying these delicious beauties at the farmer’s market recently. The tale of the tasteless carrot. There’s a great story in chef and sustainability advocate Dan Barber’s book The Third Plate about carrots. The organic farm at Chef Dan’s famous Stone Barns Center for Food & Agriculture produced an organically grown carrot measuring 16.9 on the Brix refractometer scale, which measures sugar density of fruits and vegetables (often used in the wine industry to test when grapes have reached peak ripeness). 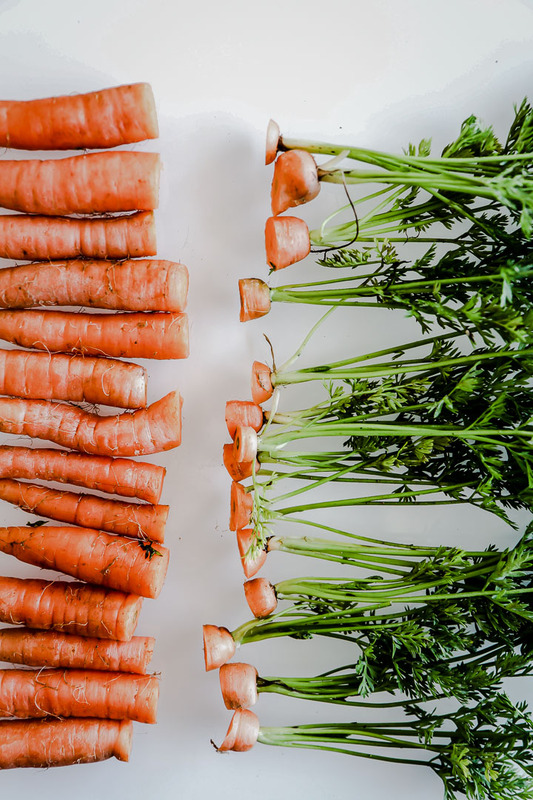 The average carrot is much lower on the scale at 6, and some industrially farmed carrots have registered much lower on the Brix scale at 4 or below. But why would carrots measuring differently on the sugar scale and why does this matter to me? WHY IS AN ORGANICALLY GROWN CARROT’S BRIX SCORE HIGHER? An industrially farmed carrot most likely has been grown in a large monoculture farm growing only carrots. It’s environment is carefully managed: from soil to temperature to pest control to harvest, the crop is tended to produce a large, uniform product that can be sold in bulk to large retailers. It’s environment is controlled in every way possible to produce this carrot and the carrot is allowed every opportunity to grow without undue stress. An organically grown carrot, on the other hand, is stressed. It is likely grown on a biodiverse farm with other crops, meaning it’s conditions are not tailored for optimum carrot growth. It is not treated with soil nutrients or inorganic pesticides, so it gathers nutrients from soil that is rich in microbes and fends off pests with its own natural defenses. Some carrots in a harvest will succumb to the stress of growing up on an organic farm, but the strongest of them all will thrive. The stress created will in turn into a more delicious, but possibly not as pretty, end product. Why does a carrot’s brix score matter? 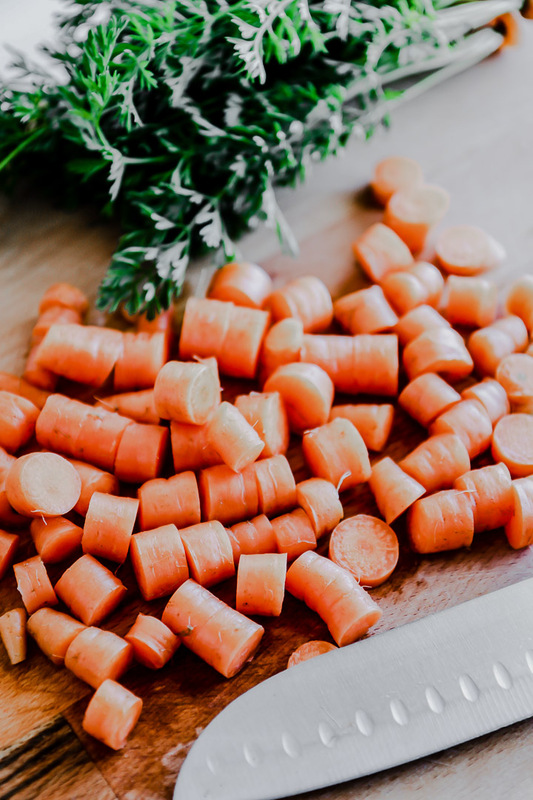 Carrots with a low Brix score are made up mostly of starches, while carrots with a higher Brix score have converted starches to sugar. A high sugar content means a more palatable carrot, which means a tastier and more satisfying vegetable. And a tastier vegetable is more likely to be eaten instead of wasted. How many times have you eaten a bagged baby carrot expecting a nice crunch and slight sweetness to then be disappointed by a crunchy and slightly sour stick? And how many times have you then left the bag of carrots in the fridge only to throw them away because of their lack of taste? I will admit this has happened to me multiple times. Carrots (and carrot tops) in the garbage because they just weren’t palatable. Turning over a new (carrot) leaf. After researching this, I recently wanted to put this new knowledge of carrots and Brix scores to the unofficial test–so I headed to the farmer’s market. My foray into carrot nutrient structure turned into walking home from the Berkeley farmer’s market with two stuffed bags full of produce and a very messy kitchen. 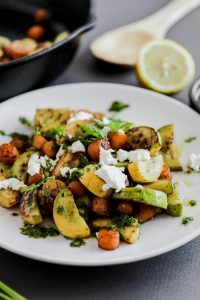 But as I sat down to eat my organic carrots pan fried in a little butter with squash, goat cheese and a chimichurri made of carrot tops I realized there was no competition: the local, organically grown carrots blew away any bagged baby carrot I’d ever eaten. And I wasn’t going back. 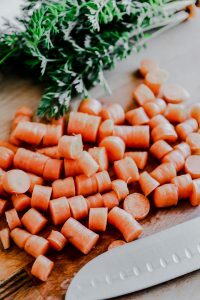 Yes, using as much of the edible parts of vegetable as you can is a more sustainable way to prepare foods but the most important reason for eating carrot tops (or any vegetable, for that matter) is because they are delicious! Carrot tops have small, leafy sprigs that are similar to parsley and can be used in any way that you would use a more traditional herb. I, for one, am a huge parsley fan and believe it should be given more attention than it’s usual role as a garnish. My personal favorite way to use the herb is in a chimichurri sauce and carrot tops can be a great substitute! Cut carrot tops (leaves and some stem) and pulse in food processor with 2 cloves garlic until pieces are small and uniform. Save carrot stalks. Add lemon juice, olive oil and cumin to food processor. If you like your sauce a bit chunkier, pulse until wet ingredients coat dry (about 10 short pulses). If you prefer a smoother sauce, mix continuously about 10-15 seconds until sauce is smooth. Whisk together olive oil and honey. Add butter to heated pan, then pour in olive oil and honey mixture, whisking on pan to combine with butter. Cut carrots and other seasonal veggies (I chose summer squash) into small pieces and add to pan, cooking ~10 minutes or until veggies are soft but not overcooked. When veggies are done, transfer to plate, top with crumbled goat cheese, drizzle with carrot top pesto and a small amount of salt and pepper if needed. Dig in! And pat yourself on the back for not throwing away perfectly good carrot tops. You’re a food waste warrior! 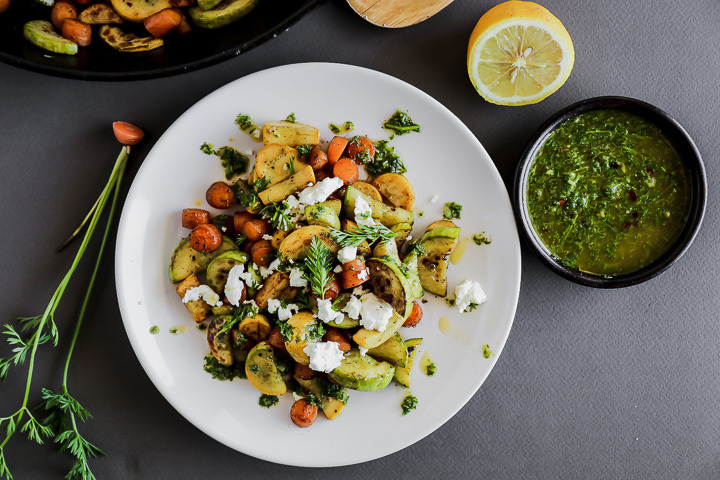 The carrot top chimichurri sauce will yield much more than needed for this recipe, so enjoy on on salads, veggies or meats! 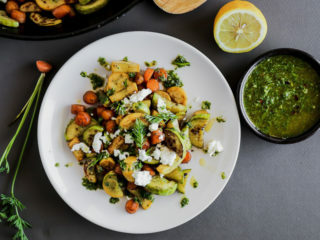 Loving this honey-glazed veggies with carrot top chimichurri? Try my Brussels Sprouts with Shallots, Maple & Mustard, Roasted Cauliflower with Gorgonzola & Lime, or Turnip Carrot Cakes with Garlic Aioli. 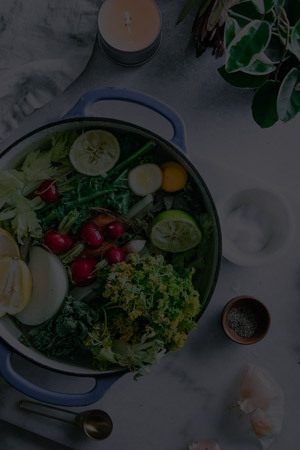 Or head on over to the Fork in the Road recipe page for more globally-inspired, plant-forward recipes. Do you like eating “root-to-stem”? What creative kitchen hacks have you found that help you reduce waste? Leave your recipes or ideas in the comments below! Not a dense question at all! Thank you for pointing it out, I recently switched website themes and lost my previous recipe card data. I’m starting the long process of updating them all and this one slipped through the cracks. Thanks for letting me know and I hope you enjoy the recipe if you make it! When and how much honey do you add? I’m missing the olive oil and honey glaze instructions. Thanks for the comment, I went back in and revised the recipe. This recipe is a bit older and it needs a bit of revision so the instructions are clear, but hopefully my updates helped. Thanks!